Champville fired past Atlas to sweep the series. Champville players were unselfish on offense dishing 25 assists. It was a great evening for Iranian center Hamed Haddadi (218-85) who led his team to a victory scoring 8 points, 19 rebounds and 5 assists. 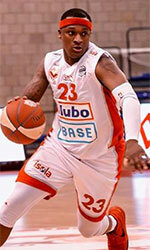 American forward Dewayne Jackson (203-90, college: Morgan St., agency: Higher Vision Sports) helped adding 27 points. The best for the losing side was point guard Joseph Zaloum (180-90) with 4 points, 7 rebounds and 12 assists and the former international power forward Jad Bitar (204-88) produced a double-double by scoring 10 points and 12 rebounds. Both teams had four players each who scored in double figures. Since the result was very predictable, it gave the chance for the coaches to test many bench players which allowed the starters a little rest for the next games. Beirut Club outgunned Moutahed to take 2-1 advantage. It was a great evening for the former international forward Ali Haidar (201-90, college: Michigan Tech) who led his team to a victory scoring 23 points and 8 rebounds. American guard Chris Crawford (193-92, college: Memphis) helped adding 16 points, 6 rebounds and 6 assists. Beirut Club's coach Patrick Saba allowed to play the deep bench players in such tough game. The best for the losing side was American point guard Marvelle Harris (196-93, college: Fresno St., agency: Slash Sports) with 24 points, 6 rebounds, 4 assists and 5 steals (went 7 for 7 at the free throw line) and the other American import power forward Brandon Mobley (206-91, college: Seton Hall) produced a double-double by scoring 14 points and 13 rebounds. Homentmen cruised past Hoops to advance into the semifinal stage. Homentmen looked well-organized offensively handing out 23 assists comparing to just 10 passes made by Hoops Club's players. It was a good game for U.S. Virgin Islands-Puerto Rican point guard Walter Hodge (183-86, college: Florida) who led his team to a victory with 15 points and 6 assists. Nigerian-American guard Michael Efevberha (193-84, college: CS Northridge, agency: Octagon Europe) contributed with 12 points and 7 assists for the winners. Four Homentmen players scored in double figures. Ali Mansour (-98) answered with a double-double by scoring 12 points, 12 rebounds and 6 assists and the former international Bilal Tabbara (198-93) added 9 points and 7 rebounds in the effort for Hoops Club. The winner was already known earlier in the game, so both coaches allowed to play the bench players saving starting five for next games. Riyadi stormed past Byblos to reach the next round of playoffs. Al Riyadi players were unselfish on offense dishing 25 assists. It was a great evening for the former international point guard Wael Arakji (194-94) who led his team to a victory scoring 18 points and 6 rebounds. American forward Justin Brownlee (197-88, college: St.John's) helped adding 14 points, 6 rebounds and 6 assists. 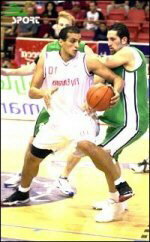 Brownlee is a former Eurobasket Summer League player, which is considered top international summer league in the market. Four Al Riyadi players scored in double figures. Al Riyadi's coach Ahmad Farran allowed to play the deep bench players saving starting five for next games. The best for the losing side was American forward Aaron Nelson (205-91, college: S.Indiana) with a double-double by scoring 26 points and 16 rebounds and the other American import forward Malcolm Riley (196-93, college: Texas Southern) scored 4 points and 16 rebounds.